When recalling the roots of soul music, most people are likely to name Memphis, Detroit, or New Orleans, but Florida also has a rich soul music history that has often gone unrecognized. John Capouya celebrates great artists of the Sunshine State who produced some of the most electric, emotive soul music America has ever heard. Drawing on extensive interviews with surviving musicians to re-create the excitement of soul’s golden age, Capouya outlines Florida’s contributions, including singers James and Bobby Purify, Sam Moore of the legendary duo Sam and Dave, and how Hank Ballard created his international hit song “The Twist” after seeing the dance in Tampa. Born in the era of segregation, with origins in gospel, rhythm and blues, and jazz, soul music is still very much a part of our collective culture, and Florida is one of its capitals. John Capouya is associate professor of journalism and writing at the University of Tampa. As a journalist, he worked for publications including Newsweek and The New York Times. His previous book, Gorgeous George: The Outrageous Bad-Boy Wrestler Who Created American Pop Culture, is being adapted into a feature film. 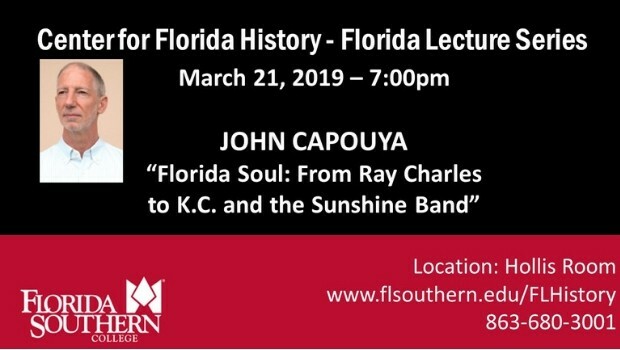 The Florida Lecture Series is a forum that brings speakers to the Florida Southern College campus to explore Florida life and culture from a wide range of disciplines, including history, public affairs, law, sociology, criminology, anthropology, literature, and art. The overall objective of the series is to bring members of the community, the faculty, and the student body together to interact with and learn from leading scholars in their fields.